Kawai KDP90 offers you great performance. It is perfect for anyone who is on a budget looking for a digital piano with great features. With KDP 90 you will get outstanding value for your money. KDP90 is a unique digital piano that utilizes Kawai’s acclaimed Harmonic Imaging Sound Technology. It features 88-key piano sampling technology to create an extraordinary piano sound. Kawai is known for its touch and feel instruments. It has perfected in this art. Kawai’s digital piano action is of high quality construction and gives you an authentic feel. This gives players a complete freedom in their musical expressions. The feel of the KDP90 is terrific; this is because of the Advanced Hammer Action IV, the 88-note as well as the graded hammer action with superb feel and sensitivity. KDP90 comes with built-in sliding key covers. The covers are well designed to give the keyboard the protection it needs from dust and debris when you are not using the instrument. 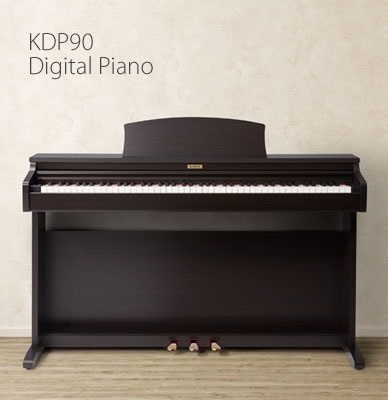 KDP 90 features 3 pedals – sostenuto, damper, and soft. The KDP90 88-key digital Keyboard offers a handy built-in digital metronome with a diversity of time signatures and adjustable tempo. These come in handy when you are practicing. The piano comes with an easy to use three song build in recorder. This is ideal for recording your performance or progress.